When I left Lexington in 1995 to head to Washington, D.C., I left behind friends and my work in the local theatre community here. In D.C., I stopped acting and started dancing. On St. Patrick’s Day this year, I get to go back to my theatre roots and I couldn’t be more excited. 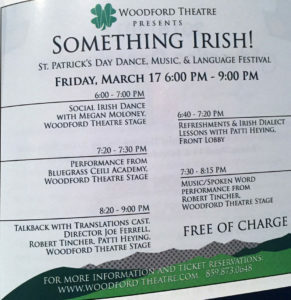 Bluegrass Ceili Academy will be joining Woodford Theatre this March 17 and we are inviting our community to celebrate the day with “Something Irish.” Explore Irish dance, music and language and meet the folks behind Translations, by Irish playwright Brian Friel, which opens March 24. It’s an evening full of Irish arts and culture! Something Extra brings a variety of surprises separate from the season subscription. We want to broaden our programming to fill your appetite for more and different. Something Extra may be an evening that prepares you for an upcoming production, or it may be a celebration of the community, or a guest artist performance. dance teaching experience to our Central Kentucky community. We offer weekly Irish dance classes in partnership with Lexington Park & Recreation, and free monthly classes at McCarthy’s Irish bar.